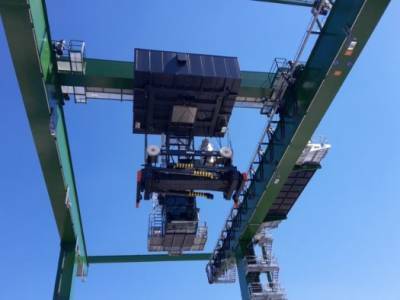 Together with the Austrian crane manufacturer Hans Künz GmbH, sensor manufacturer LASE has successfully implemented the application LaseLCPS-2D, the load collision prevention system, for two crane systems at the Intermodal Terminal WienCont in Vienna, Austria. 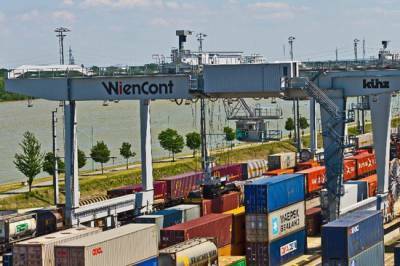 The Intermodal Terminal WienCont is one of the biggest container terminals for inland ports in Europe, where approximately 200,000 containers are handled annually. By the installation of this laser measurement system, containers can be picked safely and quietly, without any collisions. Primarily, WienCont put a high emphasis on the Soft Landing function for the crane driver assistance system. This function is activated while the load is being hoisted, and ensures that containers drop without any wear and with significant noise reductions – something which has hugely benefitted residents who live close to the port. The LaseLCPS-2D system comprises two 2D laser scanners from the LASE 2000D-Series that provide highly precise 2D profiles to the measurement software. The laser scanners are mounted under the crane trolley in order to generate a scan area in both trolley directions. While driving over the container stacks, a current height profile of the containers is created immediately. Simultaneously, the laser scanners measure the height of the load. If a finished container moves, the relative distance between the objects is ascertained by the relative position measurement. Thus the measurement system can control the hoist so that objects can be dropped ‘gently’, preventing collisions, even if the hoist – with or without container, drives over the container stacking area. LaseLCPS is also available as a 3D version (by the use of 3D laser scanners) and ensures safe, gentle and reliable handling of materials for Rubber Tired Gantry Cranes (RTG), Rail Mounted Gantry Cranes (RMG) and Ship To Shore Cranes (STS). To see the LaseLCPs-2D in action, view the animated video demonstration below – please note, the video has no sound.